Who 'pulled trigger' on el-Dorado sky forest amphibians? A long-running boffinry brouhaha regarding the disappearance of a rare golden toad has taken a new turn, with the latest team of scientists insisting that in fact human-driven climate change was not responsible for the creatures' demise. Toad-murder detectives at work in the cloud forests. 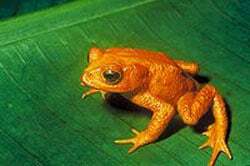 The auric amphibians in question were the renowned golden toads of the Monteverde cloud forest on the Pacific coastal mountains of Costa Rica. The small, wantable creatures went the way of the dodo back in the 1980s, and are frequently cited by warming alarmists as having been done for by rising global temperatures. The toads were actually snuffed by a pathogenic fungus known as chytrid, but scientists on both sides of the debate agree that the killer fungus' effects were enhanced by an unusually dry spell in the Monteverde cloud forests during 1986-87. The drying caused the moisture-loving money toads to gather in a limited number of puddles to reproduce, causing the deadly chytrid rot-plague to spread rapidly. Some climate researchers argue that the late-eighties dry spell was the result of man-made, carbon driven global warming. “Disease is the bullet killing frogs, but climate change is pulling the trigger,” according to leading frog boffin J Alan Pounds of the Monteverde nature reserve. However a new study argues that in fact the toad-slaying dry spell was within the normal variation of the cloud forests' climate, and was in fact caused by a pronouced El Niño - a normal variation in Pacific currents which affects weather patterns worldwide - at that time. “El Niño pulled the trigger,” contends Kevin Anchukaitis of Columbia uni in the States. “There’s no comfort in knowing that the golden toad’s extinction was the result of El Niño and an introduced pathogen, because climate change will no doubt play a role in future extinctions,” he adds. 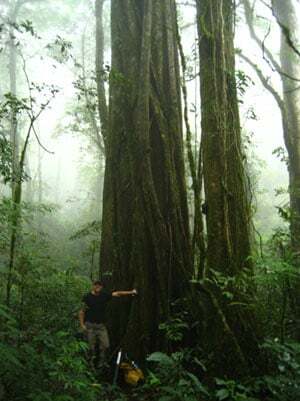 Anchukaitis' team used tree-growth analysis to generate wetness statistics back into the past of the cloud forests. Actual tree rings aren't so much seen in the tropics, where growth rates are more constant round the year, so isotopic oxygen measurements were made in samples drilled from the Costa Rican trees. There was gold in them thar hills. The new study, clearing humanity on the charge of murdering the golden toads of the cloud forests with our selfish habits, is titled Tropical cloud forest climate variability and the demise of the Monteverde golden toad. It is available online for subscribers to the Proceedings of the National Academy of Sciences. Pounds, however, is sticking firmly to his belief that we carbon-spewing westerners killed the golden toad. He says he has detailed files collected over forty years showing that the cloud forests are going to hell.